Fleurie is probably the most feminine of the Beaujolais. This new addition to the domain is a very special Fleurie. Within the Fleurie area, some parcels are of greater quality, like ours, on the footsteps of "La Madone", a very rugged landscape with steep slopes, probably the best "climat" (in Burgundy, a delimited area with specific characteristics) in the Fleurie Appellation. Our parcel, on the lieu dit "La Cadole" is almost completely surrounded by the prestigious La Madone vineyard that gave the recent Gold Medal winner at the International Wine Challenge in London in 2008, probably the most prestigious wine competition with more than 40000 samples from all over the world. A vibrant red in colour, with a rich, velvety texture and an elegant mix of fruit and floral aromas such as iris, violet, summer roses, peach, blackcurrants and red fruits. 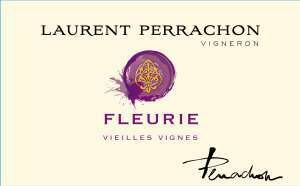 Fleurie is the most feminine of the Crus. Serve at 13° C, with lamb, poultry and white meats.